Dr. Mandava received his doctorate in dental surgery from New York University, College of Dentistry in 2004. While attending NYU he experienced working at several facilities and gained valuable knowledge by assisting with many complicated surgical procedures. He has practiced restorative and oral surgery and cosmetic surgery for more than 12 years and now owns the practice here in Middlebury, Connecticut. 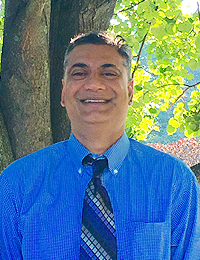 Dr. Mandava is a member of the American Dental Association, Connecticut State dental Association and local dental societies. He is dedicated to continuing his education year after year and keeps up with the newest advances in technology today. He has implemented the CEREC CAD CAM same-day crowns technology to our practice along with using the most minimally invasive instruments for a modern practice with the use of laser and digital x-rays. He is married to his wife Sheela who also practices dentistry. They have two wonderful children, Archi and Anish. Dr. Mandava loves basketball, cooking and reading in his spare time.